An extract from Tony Robbin’s Shadows of Reality: The Fourth Dimension in Relativity, Cubism, and Modern Thought, on Edwin Abbott’s Flatland: A Romance of Many Dimensions. Enjoy. Linda Henderson has traced the history of using a two-dimensional being observing three dimensional space as an analog of our attempts to visualize the fourth dimension. In The Fourth Dimension and Non-Euclidean Geometry in Modern Art (1983), she cites many authors who have used this device: Carl Friedrich Gauss by the 1820s, Gustav Theodor Fechner in 1846, Charles L. Dodgson in 1865, G. F. Rodwell in a May 1873 issue of Nature, and Hermann von Helmholtz’s lectures and many publications beginning in 1876. 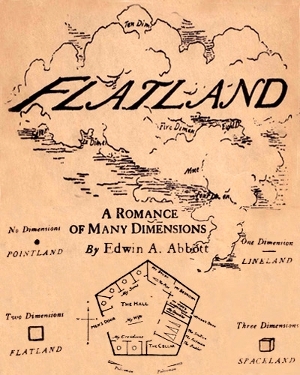 Perhaps the best-known example, however, is the English clergyman, educator, and Shakespeare scholar Edwin Abbott Abbott and his immensely popular book Flatland (1884), a novel set in a society that was literally two-dimensional. Abbott had many agendas for his short novel. His main goal was to satirize the social structure of the Victorian age. In Abbott’s two-dimensional country, women have the lowest status, as they have little or no intelligence, imagination, or memory but possess a violent temperament. Since they are just lines, and therefore all point, by law each must ‘‘in any public place [sway] her back from right to left’’ to avoid the lethal poking of anyone: ‘‘The rhythmical and, if I may say so, well modulated undulation of the back in our ladies of Circular rank is envied and imitated by the wife of a common Equilateral’’ (15). Indeed, rank, class, and class struggle fill most of the book. There is a rigid stratification of men depending on how many sides they have as polygons. It is a ‘‘Law of Nature’’ that sons gain a side on their father, but this law does not apply to ‘‘Tradesmen, still less often to Soldiers, and to the Workmen; who indeed can hardly be said to deserve the name of human Figures.’’ Though it is possible for children to jump a whole rank in exceptional cases, the game is fixed so that only token advances can be made, ‘‘for all the higher classes are well aware that these rare phenomena, while they do little or nothing to vulgarize their own privileges, serve as a most useful barrier against revolution from below’’ (10). Language is important in Flatland, and errors of tact or manners can have disastrous effect on status, some lasting for five generations. Deviancy and irregularity, for example as to the length of sides, can be punished by death. And during the Color Revolution, a renaissance when art flourished and the rigidity of society relaxed to allow for a more open culture, the resulting degradation of the ‘‘intellectual arts’’ and the confusion as to status so alarmed the populace that they were only too happy to have the Priests and the Aristocracy crush the Colorists and outlaw color altogether.